Sotheby’s head of Aboriginal art, Tim Klingender, is confident the auction of 153 works will reach its estimate of $2.5million to $3.5m. 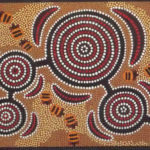 Last year’s Aboriginal art sale recorded $3.7m. But, like many arts specialists, Mr Klingender has had to convince his vendors to lower their expectations and agree to “very conservative estimates”. In 2007, more than $175m of art sold in Australian auction rooms. This year, the total sales figure will be lucky to reach $70m, the lowest result in 10 years. So far, $30.4m of art has sold at auction. The Sotheby’s sale in Melbourne begins the next round of local art auctions. Melbourne collector Arthur Roe said it was an important one. “It is the major indigenous art sale in the world and if someone like Tim Klingender can’t put together a catalogue that sells well, then no one can,” he said.